Barack Obama had a slip of the tongue in Kogelo, Kenya this past weekend. It’s not the first time Obama made this mistake. 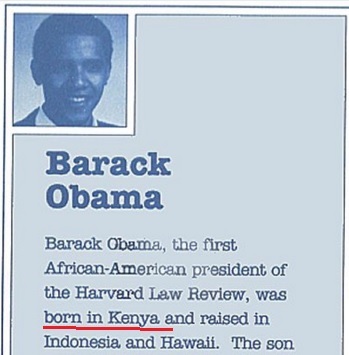 In an earlier bio Obama wrote that he was from Kenya. Obama is allowed to “misspeak” -— conservatives, and especially Trump, are not!!! Not Fake News. Never was. George Stephie is on retainer and will handle this. Big Media will ignore and/or attack anyone who notices this. The Fraud knows he is covered at all times. Did George Stephanopolous immediately jump in and say "you mean your father was from Kenya!" ? That's how it's usually handled when Obama "misspeaks". It does not matter if he was born in Hawaii if his father was a foreign national. Children of foreign nationals inherit the nationality of their foreign national parent(s). Natural born citizen means born here of citizen parents. People born with divided loyalties, allegiance and citizenship are not naturally Americans. The children of foreign nationals are precisely who the founders were excluding from the office. Only when one cannot be anything else can one be a natural born citizen. Natural born citizen are naturally citizens because they have only one nationality. No foreign influence on the Presidency is what John Jay stated in a letter to George Washington as the reason for insisting on a natural born citizen. Obama told us he was born a British subject. Who believes Washington, Jefferson, Adams, Jay, Monroe, Madison, etc. would have found him to be a natural born citizen? He knew exactly what he was saying, just like he knew exactly when he gave the middle finger for that famous photo. It appears Obama now feels safe publicizing his ineligibility. But since both of the major political parties were in on it, nothing can happen. <><> $50 million US tax dollars to his tax-exempt foundation in the form of a grant to Kenya (foundation named for his Kenyan father). A Kenyan lawmaker told the nation's Parliament last month (March 2010) that Barack Obama was born in Africa and is therefore "not even a native American." "If America was living in a situation where they feared ethnicity and did not see itself as a multiparty state or nation," Orengo posited, "how could a young man born here in Kenya, who is not even a native American, become the president of America?" Orengo held up the U.S. as a country no longer "living in the past," since Americans elected a Kenyan-born president without regard to "ethnic consideration and objectives." Debate is then recorded in the Kenyan government's official March 25, 2010, hansard  a traditional name for printed transcripts of a parliamentary debate  as continuing with no other MPs mentioning or attempting to correct Orengo's comments about Obama. Many years ago, Obama typed up a brief biography of himself for a book jacket. He made a slip of the tongue way back then too when he typed that he was from Kenya. He is taunting US that our entire government ignored the Constitution that he loathes to allow him to usurp the office that Constitution says he cannot hold. BOTH parties colluded to violate the Constitution. 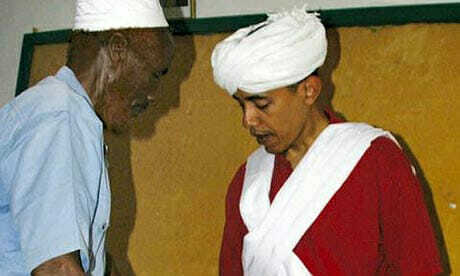 He’s as Kenyan as I am..His baby daddy is Frank Marshall Davis. It’s OK, bammy. You are no longer president. You can let us in on the truth, that you are an America-hating marxist crypto-gay who used the power of his office to favor *slamic terrorists.